: The Lhasa Apso comes from Tibet where many live at high altitudes and the climate can be severe. He has to be a hardy little dog to withstand these conditions, and this has had a great influence on his development. 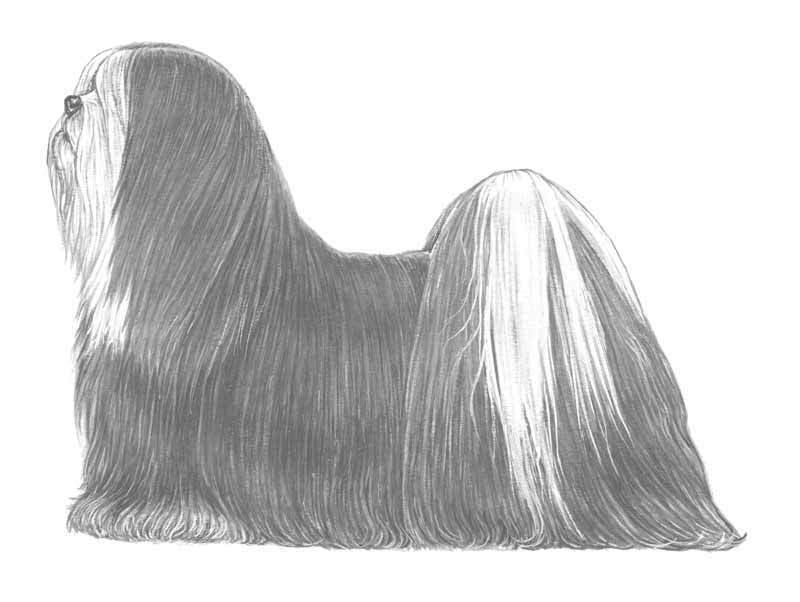 His long, hard coat with its dense undercoat acts as insulation during winter, and the fall of hair over his eyes protects them from the wind, dust and glare. : Length from point of shoulders to point of buttocks greater than height at withers. : Gay and assertive. Alert, steady but somewhat aloof with strangers. : Head furnishings with fall over eyes; but not affecting the dog’s ability to see, good whiskers and beard. : Moderately narrow, falling away behind eyes, not quite flat, but not domed or apple headed. : About 4cms, but not square; length from tip of nose roughly one third of total length from nose to back of skull. Foreface straight. : Ribs extending well back. : High set, carried well over back but not like a pot-hook. Often a kink at end. Well feathered. : Forelegs straight, heavily furnished with hair. : Well developed with good muscle. Good angulations. Heavily furnished with hair. : Hocks when viewed from behind parallel and not too close together. : Golden, sandy, honey, dark grizzle, slate, smoke, parti-colour, black, white or brownish. All equally acceptable. : Males 25 cms, females slightly smaller.